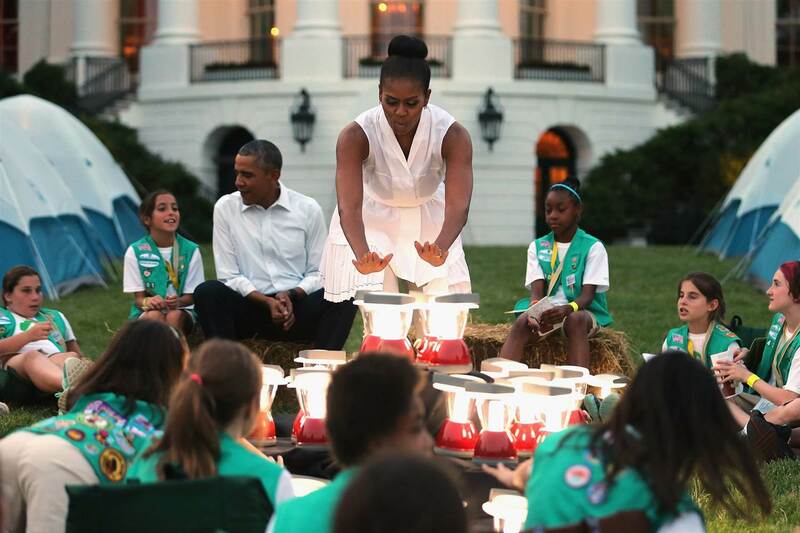 Michelle Obama, honorary national president of the Girl Scouts, welcomed a group of 50 fourth-grader Girl Scouts for a once-in-a-lifetime campout on the White House South Lawn Tuesday. This was the first time that such an event had been held on the grounds. "This is something you can tell your kids and your grandkids," said Obama. "Do you understand the impact, the importance of this moment, today? It's exciting." The campout was arranged as part of the First Lady's Let's Move campaign against childhood obesity, which also encourages families to take to the outdoors. President Obama joined the girls for a sing-a-long and later for a look at Saturn through a NASA telescope. He joked with them, "What are you guys doing in my yard? When did you guys show up here?" FLOTUS herself was not a Girl Scout, but said she wanted to try to "officially earn a badge", though she drew the line at attempting to earn one for scaling a rock climbing wall. "I don't know anything. I don't know how to tie a knot. I don't know how to pitch a tent. I'm definitely not climbing that wall." She did later learn to tie overhand and square knots, however. The 50 lucky girls spent the evening climbing said rock wall, pitching tents, and completing orienteering exercises to earn an outdoors badge. Late at night, they were moved inside to a conference room in a building adjacent to the White House when rain began to fall after they were nestled inside their sleeping bags. We're sure the rain didn't dampen what sounds like an incredible experience!